JungleWatch: MORE: FR. 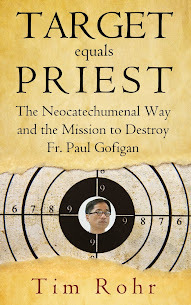 ADRIAN "THE FUGITIVE" CRISTOBAL, FROM JANET B: "HOW ONE PRIEST NEARLY DESTROYED THE CHURCH ON GUAM." MORE: FR. ADRIAN "THE FUGITIVE" CRISTOBAL, FROM JANET B: "HOW ONE PRIEST NEARLY DESTROYED THE CHURCH ON GUAM." "Jungle Watchers will remember one of our most frequent, persuasive and accurate commenters named Janet B from Mangilao. Janet B has made contact through the JW hotline and offers several posts dealing with Fr. Another RMS seminarian was pulled out of high school before his senior year to enter the seminary. This young man also publicly admitted to being completely drunk when he entered the seminary. Hmm, maybe Adrian himself fixed up a batch of the KIKO kool aid. None of these other local men from the NCW have been ordained. Were any of these men were able to fix their personal imbalances they revealed? Adrian was fuming…and concerned. Fr Adrian, the man who brought the NCW to Guam, was hell bent to squash any vocation that was not from the NCW communities. He had become a dictatorial Vocations Deflector. The most terrible example of this is the treatment young Aaron Quitugua received in trying to pursue the calling he felt from God. Adrian the Vocation Deflector tried to get Aaron to go to RMS Guam. But Aaron wanted to be a diocesan priest and wanted to serve the people of Guam. He did not want to live a missionary life away from the island he loved. He did not want to join the NCW. Aaron wanted to go to Mt. Angels Seminary in Oregon, or to St Patrick’s in California. This young man was told the Archdiocese couldn’t afford to send him off island. What Adrian didn’t say was that the RMS Guam was spending a million dollars a year to form NCW priests in Yona. Only the random bragging by Apuron during a parish meeting at St Francis Church would reveal this incredible price tag. This fact surely opened the eyes of the people of Guam to the true cost of this foreign invasion Adrian had brought to our shores. Not deterred, Aaron’s drive and calling was so strong that he went out on his own and found enough benefactors so he could pay for the entire cost of an accredited seminary formation, and the Archdiocese wouldn’t have to pay a single penny. What a great deal for Guam! All he needed was a letter of sponsorship from Apuron. Adrian jumped into quick action and convinced Apuron to refuse to write the sponsorship letter this young man needed to pursue his calling to the priesthood. You may be asking yourselves: how many other men wanted to be priests for Guam, but were turned away by our very own vocation deflector, Adrian Cristobal? We may never know, since the Vocation Deflector and Bishop Apuron were “almost perfect” in destroying all evidence of their devious actions to kill local diocesan vocations. Thanks, Tim, for turning comments back on! I'm glad Janet reminds us of the rantings of young seminarian, Gabe Camacho. A lot of folks do not want to hear the entire 6 minute talk he gave during Holy Mass at the Cathedral, but you should at least listen to the recording from 3:10 through 4:00 where he talks about taking advantage of women, and probably having 2-3 kids from different women, and coming home drunk, not knowing what he was doing. Thanks to Fr Adrian, this is the quality of priest he wanted us to have. And unfortunately, we saw these same traits exhibited in his older brother, Fr Luis Camacho, with that poor girl from the south who he took advantage of. 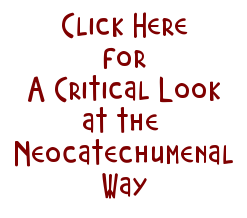 When I was in the NCW, the things I heard were frightening only in the beginning. We slowly were brainwashed into thinking that this is the acceptable way that people are, they are inherently bad, but God loves them for exactly who they are. There was no drive to improve, just that God loved us, and our indiscretions were ok. I am one of the lucky ones that was able to escape the NCW, but it was because I had a few really good friends that finally convinced me the real Church was where I needed to be. I never forget these friends, and I NEVER regret the day I decided to leave the cult that was directing me to their hell.